These turned out perfectly. As in, I had not a single issue. Being that these are macarons we are talking about, I say this with much pleasure and pride. The first time I made macarons was about year ago and I tried David Lebovitz's safe, trusted and true French chocolate macarons. I thought those turned out well. Ohh boy, was I wrong. They were good, but not compared to these beauties. As I mentioned in my previous post, it is very important to weigh all of your ingredients when making macarons as the wet to dry ingredient ratio must be perfectly balanced or things could start going tragically awry, i.e. causing the batter to be the incorrect consistency. Even once you have the right proportions of ingredients, you need to treat them like your favorite child (not like people have them or anything…). Don't over-beat the egg whites as it could cause the macarons to be all sorts of lumpy, lopsided and misshapen. But there is a fine line you see because if you don't beat the egg whites enough, the macarons will fail to thrive and there is a good chance you won't get the prized feet. I am in no way shape or form a master of the macaron, so I recommend you head over to Not So Humble Pie if you have more questions. I took this picture a few days after I filled the shells because I'm a bad person. If not a bad person, at least a cookie neglector. I'm surprised it's not an offense punishable by food blogger law, or if it is and I just don't know it yet, please go easy on me! I swear, I just got side tracked and I was packing for a trip down to Eugene! Now that you're well informed that these are not in fact mutant macarons, they are in my opinion only one notch below Laudree's and 5 notches above the ordinary. 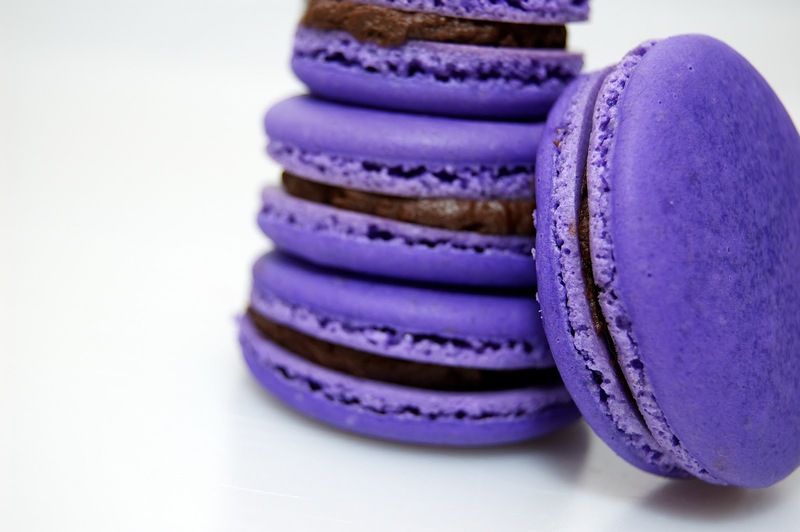 The floral lavender is an unexpected delight to the tongue with the sharp contrast of the extra dark chocolate mellowing everything out. I would like to note that the chocolate I bought was a smidgen too dark, so I added a little honey to the ganache as I was whipping it up. 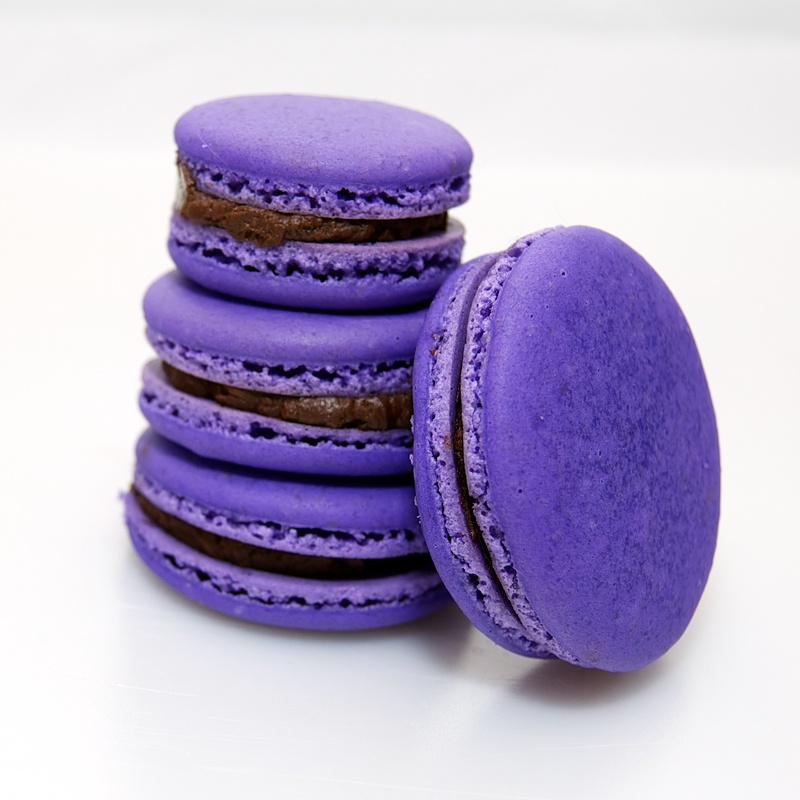 Not only do honey and lavender pair wonderfully together, but it made the dark chocolate a little less harsh. Next time I make these, I might try a lemon curd filling, lemon, fig, olive oil or vanilla bean filling….hmmmm, suggestions? Prepare your baking tray and baking sheets. In a large mixing bowl mix the egg whites with an electric hand beater until it is thick and frothy. Gradually add the granulated sugar, continuing to whisk, until the mixture turns into a thick glossy meringue (think hair mousse from the 80's). Make sure the meringue is not over-beaten or else it will be too dry. In a food processor pulse together icing sugar, almonds and lavender buds until everything is finely ground and powdery. Sift the mixture 2 or 3 times to make sure there are no lumps. Place the dry ingredients into a bowl. Add the meringue in three portions, giving it a quick fold between additions. Fold the mixture a few times to break the air. Add some of the purple food coloring till you get the shade of purple you like best (do not add as much as I did). Continue folding until you get a smooth and supple mixture, thick in consistency so that when you lift the spatula it flows back in thick ribbons. Fill a piping bag with a plain tip with the batter and pipe small rounds (2 cm in diameter) on your prepared baking paper. Leave the macarons to rest and dry for about 45 minutes. In the meantime preheat the the oven to 300 degrees. When the macarons are ready bake the shells for 12-15 minutes. Remove from the oven and allow to cool. Use a flat offset spatula to gently remove the shells from the baking paper and allow to cool further on a rack. Heat the cream in a small saucepan. Pour over chopped chocolate, let sit for one minute, add honey, then whisk until smooth. Place in refrigerator to cool, stirring every 10 minutes to ensure even cooling. When are desired consistency for piping, fill pastry bag fitted with ¾ inch tip and pipe onto macaron shell. Pipe the ganache into the shells and gently cover with another shell. Do not press. Continue to do this until you have used up all of the filling and shells. I'm not a big fan of macarons but these look so beautiful I'm going to have to try them. The pictures are stunning! I actually love the gorgeous purple color! Definitely well done on these! BUGNET. THESE ARE AWESOME TO BEHOLD. Jenny/Pancake - could these be made vegan?? Found you through I am mommy and had to tell you how pretty these are! You did a fantastic job! I've been wanting to make these for awhile now. Kinda scary sounding though! Love using lavender to bake... and your blog is perfect since it has so many things with lavender! I'm a fan. Check out my teenage, baking blog at http://teenage-baking.blogspot.com !